The Stampin' Up! products used on this card include: Whisper White cardstock, all In Color cardstock colors, silver glimmer paper, classic stampin' pad in Blackberry Bliss, Perfect Pennants stamp set (133230)*, Banners Framelits Dies (132173)*, itty bitty circle punch, chevron border punch, decorative dots embossing folder, Big Shot and stampin' dimensionals. *Bundle and Save (Wood 134815) or (Clear 134816). What a cool card! Love your new colours! The glitter paper is fabulous too! Fab creation, love the bright colours & shapes you have used! Thank you for sharing with us at My Time to Craft this fortnight, good luck! What a nice way to embellish your card with the new colors. The triangles accomplished your colors and design perfectly. Great card. Thanks for joining our Birthday Challenge at Love to Create. Lovely layout and colours. Thank you for sharing at CFTH challenge. Great card! Thank you for joining our Birthday Challenge this week at Love to Create. 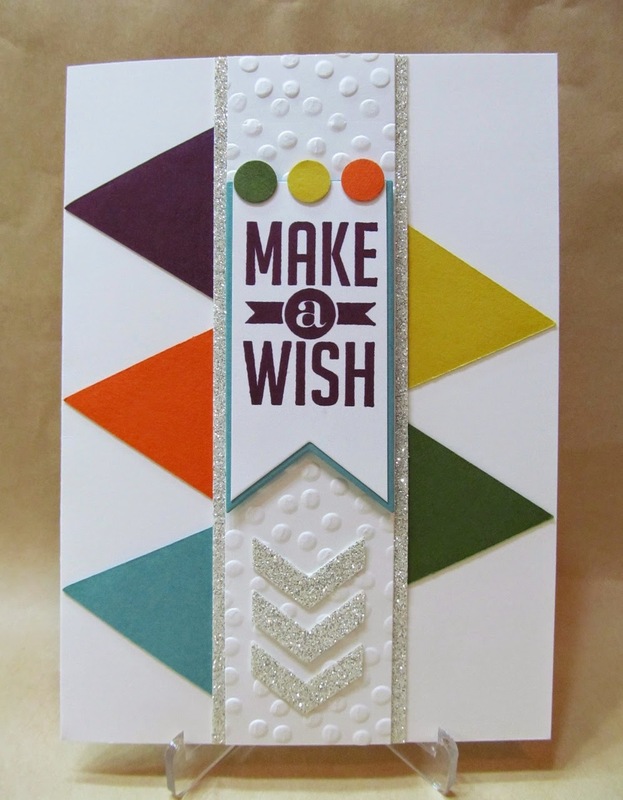 Fabulous card, love the colours you have used! !